I'll get this out of the way right now -- Mushroom Men: The Spore Wars was released last year in the beginning of December. I played and finished the game in a few days, and wrote the review within that same time frame. Don't ask. Just read. Review after the jump! 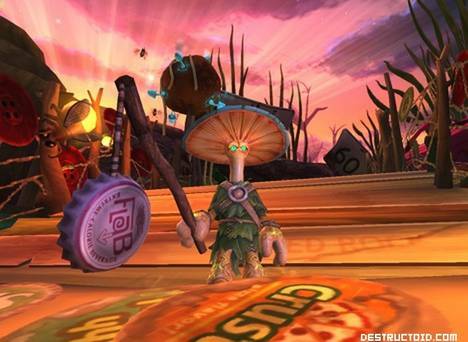 In many ways, Mushroom Men: The Spore Wars is a triumph for third-party developers struggling to squeeze in alongside Nintendo’s strong, existing franchises. The story puts gamers under the mushroom cap of a young, unlikely bolete hero named Pax, pushing them into an adventure that is both unique and original in its sights and sounds. Its common, real-world environments are interesting and fresh, viewed from the perspective of a tiny creature exploring a world that’s new to him. But as distinctive as it seems on its surface, The Spore Wars is ultimately a bit generic -- and sometimes sloppy -- in its execution. As a third-person action title on the Wii, The Spore Wars succeeds by delivering solid controls that work well with the Wii Remote, but don’t really do anything special. Developer Red Fly Studio sticks with the basics of the Wii Remote and nunchuck combo when it comes to controlling Pax. The nunchuck’s analog stick moves the little mushroom about, with the ability to block and roll mapped to the "Z" and "C" buttons respectively. Shaking the Wii Remote will make Pax attack with his equipped weapon, pressing "A" will make Pax jump, and tapping the button again will cause him to use his cap as a glider. Beyond the basics, Pax has a few other tricks up his sleeve, in the form of the "Sticky Hand" and the multi-use "Sporekenesis." Using the Wii Remote to move an on-screen cursor, hovering over certain objects or baddies in the environment will cause the context sensitive pointer to change. The "Sticky Hand" -- a quarter machine sticky toy -- can be used to reach new heights, similar to a grappling hook. "Sporekinesis" can be used to move select objects in the environment, opening up new areas or springing traps on enemies. Throughout the game, Pax encounters a number of enemies -- moles, mice, spiders, the enemy Amanitas tribe -- which he can take out with a wide assortment of weapons created from “scav” items found in the environment. These weapons are definitely one of the game’s strengths, giving you the ability to forge new and stronger items from things like a Nintendo DS stylus, corn on the cob holder, and gum. The items are all unique in their look, feel, and strength with some more capable of taking out certain types of enemies than others. Unfortunately, despite the weapon variety, combat can get a bit tedious. It essentially boils down to waving the Wii Remote. Swing it once to do a strike; swing it a few more times to perform a combo. Regardless of how you swing the remote, the result is the same, which means repetitive waggling is the name of the game here. It’s fortunate that the different weapons provide a nice, broad range of animations, but when all is said and done you’re still just waving the Wii Remote constantly. Outside of some of the large-scale bosses (many of which require an interesting use of attacks, spore powers, and pattern recognition), it’s all a bit bland, and tirelessly straight forward. It can be a wear on your wrist, and while it’s more or less responsive, becomes slightly annoying after a few hours of gameplay. Platforming and exploration fairs well, mostly thanks to the game’s unique and varied level design. Common, real-world areas like a funeral home, a backyard, and the inside of a trailer all feel new and fresh, thanks to the size of the adventurer. You’ll hop on leaves, cereal boxes, work benches, and more … even the smallest things will lend itself to these large-scale, negotiable environments. Red Fly does a great job of providing different ways to manipulate and use the environment, moving things with in the environment with "Sporekenesis," or riding the currents of a fan with your Cap Glider. There are simple puzzles sprinkled throughout as well, many of which involve changing or creating new paths. The in-game camera acts on its own, and while it’s sometimes right where you need it, it requires a bit of babysitting. Because it’s mapped entirely to the Wii Remote’s d-pad, it’s a bit of a hassle to use, requiring you to stretch your fingers or reposition your hand to make even the simplest of tweaks. But the Achilles heel of third-person exploration and platforming in The Spore Wars isn’t the camera, it’s rather how goals and paths are presented to the player. In many ways, they’re simply not. Environments are big and sometimes confusing, and with no map to consult, figuring out what to do or where to go can be way more frustrating than it should be. The game does feature a "goal" screen which is simply a piece of artwork that is filled in as goals are complete; the various pieces do offer hints of what to do, but are often ambiguous and confusing. Short, establishing cut-scenes sometimes provide fly-throughs of an area, or dialogue will direct you. But if you miss it, there’s no way to reply this -- outside of starting over -- leaving you to your own devices to figure out where to go and what to do next. Thankfully, the game is mostly linear, and moving from point A to point B is usually all it takes to trigger another event. You can play through the game in around ten hours; unfortunately, two of them may be spent wandering around aimlessly. From an artistic standpoint, The Spore Wars is stunning, whether you’re talking about the game’s audio or visuals. Character design is clever and endearing (the hulking-yet-compassionate cactus creature, Cactos, still brings a smile to my face), and the aforementioned environments are colorful, and full of character and detail. The inspiration from 60’s sci-fi comic books, is obvious and refreshing, with a tongue-in-cheek feel not unlike Topps' "Mars Attacks" trading cards. I hesitate to say that "it looks good for a Wii game," but it has to be said; Red Fly doesn’t try to push the console too hard, finding a sweet spot that simply works well with the system’s capabilities. While some textures leave a bit to be desired and some of the game’s colors tend to blend into one another (particularly its blues and greens), it’s definitely one of the better looking Wii games. 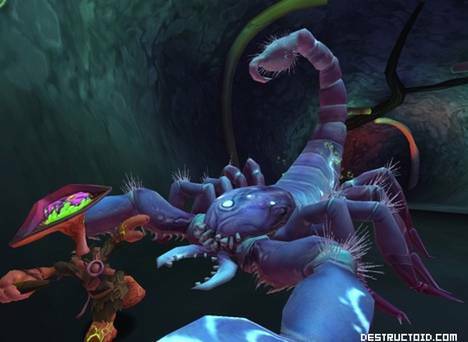 Far and away, the most impressive element of The Spore Wars experience is its sound design, and the folks at Red Fly have to be commended for its efforts. Les Claypool providing the game’s score is an obvious fit and an excellent choice; his quirky musical personality providing an excellent backdrop of up-tempo bass grooves, pops, and junk percussion. But even more impressive are the game’s sound effects, which not only lock into the game’s music groove, but also its environment. Listening to and watching the drip of a faucet or the hands of a clock ticking in time with the music’s rhythm is hypnotic, and a clever way to pull gamers deeper into the game’s bizarre world. 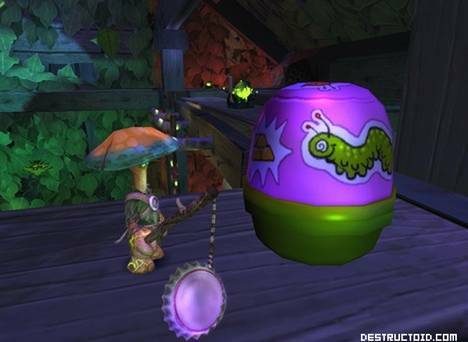 Mushroom Men: The Spore Wars threatens to be a classic, an interesting, and frequently clever third-person platformer that oozes character. With a bit more polish and direction, it could have been one of the best Wii games of 2008, especially for gamers looking for classic third-person action gaming in an original universe. Regrettably, monotonous combat and occasionally baffling goals keep it from greatness. Still, what’s here is fun, and a great start to what I hope will be a running series of games in the Mushroom Men universe.